We’ve all seen smartphone with dual camera system for better field of depth, better clarity, and the ability to create effects (bokeh) to blur the background of an image. But three rear system? I had not seen any so far, and that’s exactly what Huawei P20 Pro offers with a main camera (40MP), a telephoto camera (8MP), and a monochrome camera (20 MP). The phone will run Android 8.1 with EMUI 8.1, and ship with USB-C earphones, a charger, a USB-C cable, a USB-C to 3.5 mm headphone jack adapter, a protective case, a Quick Start Guide, an eject tool, and a warranty card. 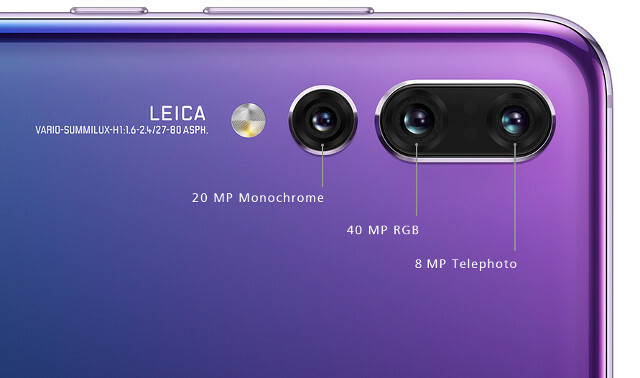 The HUAWEI P20 Pro features a Leica triple camera with the highest total pixel count on a smartphone available in the market – the camera configuration is comprised of a 40 MP RGB sensor, a 20 MP monochrome sensor and an 8 MP sensor with telephoto lens. It also features a color temperature sensor for better color reproduction. With f/1.8, f/1.6 and f/2.4 wide aperture to capture crisp, clear details, the HUAWEI P20 Pro also includes a brand new Leica 3x telephoto (VARIO-SUMMILUX-H 1:1.6 – 2.4/27-80ASPH) lens for long-range photography of up to 5x Hybrid Zoom. The HUAWEI P20 Pro’s highly sensitive image sensor captures low light photos with up to ISO 102400. That does not explain that much, but if we look at a dual camera phone like HUAWEI Mate 9, is comes with a 12MP main RGB camera, and 20MP monochrome camera with support for 2x hybrid zoom, so it looks like the company added the telephoto lens to increase the level of zoom up to 5x. DxOMark tested the phone – which obtained a 109 points score – and Popular Science tried to explain how the triple camera system works, and basically all 3 cameras work together to provide better photos, with the main camera taking “standard” photo, the monochrone camera being used to create effects leveraging A.I., and the telephoto enabling zooming up to 5 times. HUAWEI P20 Pro will sell for 899 Euros starting on April 6, 2018. Visit the product page for further information. Why not put two identical cameras on both ends of the phone and shoot “3D” stereo? @Tesla, this could be a cost issue but is quite likely also a memory bandwidth issue. The 20 MP camera probably only produces 1/8th of the data that the 40 MP color one produces (double amount of pictures and color sensors typically provide 4 times as much data as monochrome ones (assuming the same #bits per pixel). The monochrome camera can still be used to determine depth information. BTW: 40 MP is not necessarily better than 20. What happens is that the sensor cells become smaller (or the sensor bigger, but in a phone room is limited), so they catch less light per cell so less vulnerable to noise. I expect that this camera does not do too well under low light conditions. That is probably also why they have a separate zoom camera. Digital zoom on the 40 MP could also give a 5x zoom factor and an 8 MP image, but that would probably be too noisy. Is there a law that requires phone makers to copy Apple? 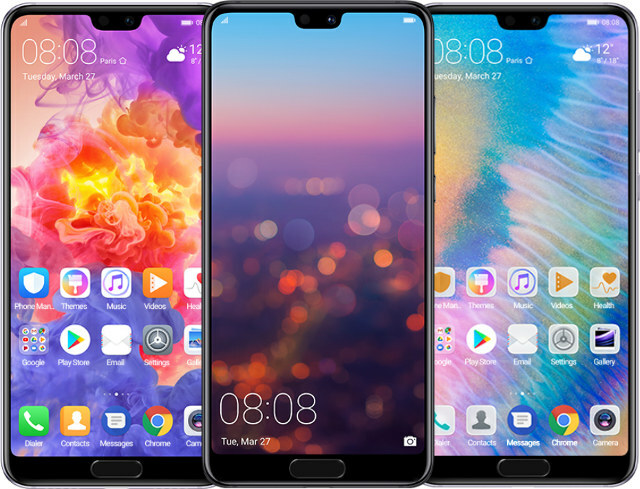 Well, Huawei have clearly moved forward a notch. You mean Essential Phone since it came out before iPhone X?